In the first floor of the Museum of Applied Arts Frankfurt, digitalcraft operates the AndersenLab, supported by our partner Andersen. 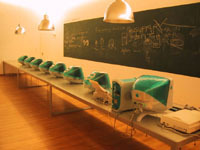 The Mac-based computer laboratory works as a experimental work environment, integrated into the public exhibition area. The exchange of know-how within different disciplines is particularly important here. 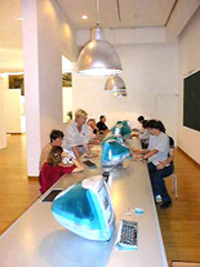 On up to eight workstations museum users form various application oriented workgroups, and get first experiences in up-to-date IT working methods such as knowledge-sharing and further network strategies. The course offers in the AndersenLab are conceived for different user groups. School classes as well as an adult audience are given possibilities to be introduced into the new technologies according to each one’s particular needs. The offer ranges from courses in digital picture arrangement and creating websites up to beginner oriented introductory programs and first internet surfing experiences.